In this sweet read-aloud, a little bird in the big city searches for the perfect puddle. 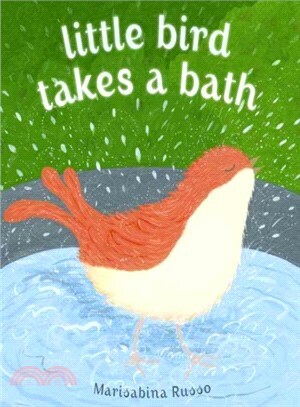 Fans of “Goldilocks and the Three Bears” will enjoy Little Bird's search for a just-right puddle after a rainstorm. He searches far and wide, but some puddles are too big, some are too small, and some are already crowded with bathers. When Little Bird finds a good-looking puddle in a city park, one surprise after another spoils his bath. A ball comes bounce-bounce-bouncing. . . . A little girl comes flip-flop-flapping. . . . And a dog comes arf-arf-arfing . . . straight through Little Bird's puddle. But soon, Little Bird finds the perfect puddle to call his own. Appealing illustrations and a rhythmic text filled with repetition and fun sounds make this an ideal choice for storytime or laptime. MARISABINA RUSSO is the author and illustrator of numerous picture books for children, including The Bunnies Are Not in Their Beds, which was called "fresh and engaging" by Booklist; A Very Big Bunny, a Bank Street Best Book of the Year; and I Will Come Back for You: A Family in Hiding During World War II, based on the experiences of her grandmother's family during the Holocaust, which was named a Parents' Choice Gold Award Winner and an Oppenheim Toy Portfolio Platinum Award Winner. Visit her at MarisabinaRusso.com.